Looks like Animal Jam found another Pack of Pesky Phantoms. I ended up getting online before this happened. New items? Nothing! Maybe they had a problem with the new item and had to fix it? Maybe they are fixing the common Quick-sand glitches and rollback glitches? Maybe they are fixing the rabbit glitch? 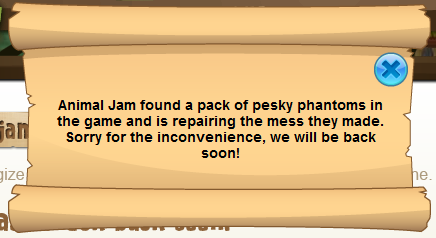 OR MAYBE they are giving me my imprisoned phantoms/phantom prison cell and 5000 gems and red jamaaliday bow I lost with the rollback glitch! This picture is the same picture I used last time. Looks like nobody did a story on four stories.